What factors caused the persecution of minorities in medieval and early modern Europe? We build a model that predicts that minority communities were more likely to be expropriated in the wake of negative income shocks. We then use panel data consisting of 785 city-level expulsions of Jews from 933 European cities between 1100 and 1800 to test the implications of the model. 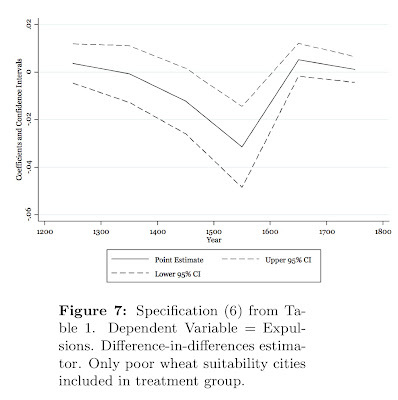 We use the variation in city-level temperature to test whether expulsions were associated with colder growing seasons. We find that a one standard deviation decrease in average growing season temperature in the fifteenth and sixteenth centuries was associated with a one to two percentage point increase in the likelihood that a Jewish community would be expelled. 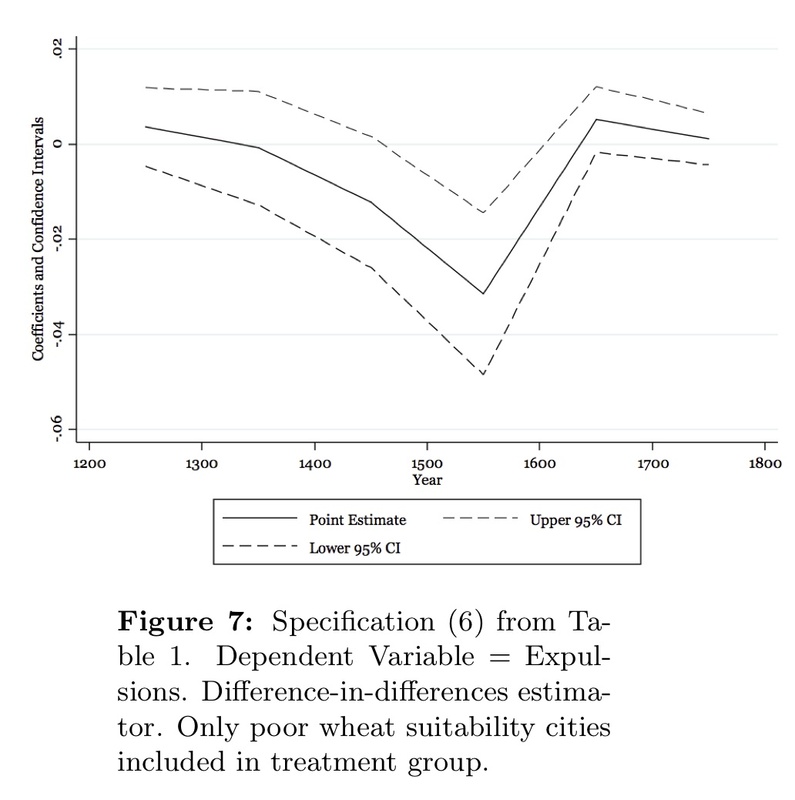 Drawing on our model and on additional historical evidence we argue that the rise of state capacity was one reason why this relationship between negative income shocks and expulsions weakened after 1600. I think the correlation between cold shocks and expulsion events is super interesting, but the discussion of state power feels like a little bit of a stretch (in terms of evidence). The authors may be right (given that they read a lot of history that I don't spend much time with), but there are big climatic changes occurring around this time as well. 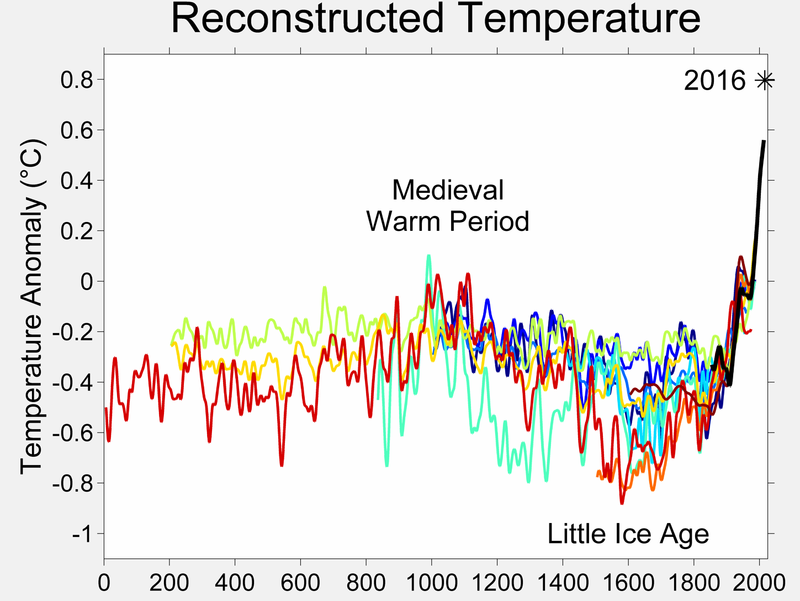 Since there is a downward secular trend in temperature until 1600, large negative shocks that are superimposed on this trend will be surprisingly cold for the population, since there will be a high likelihood that they are lower than anything experienced in recent history (similar to how modern warm events now are hotter than previous experience because our current mean temperature is trending upward). Once mean temperatures turn around in 1600, then negative shocks will not seem so bad since they're superimposed on a warming trend. It could be that this surprising nature of the extremes is what makes them so destructive to the social equilibrium, rather changes in state power. (Taken one step further, what kind of exogenous forcing might have caused medieval states to be weak? See here).